As you know (if you've been reading) we had an amazing weekend. I loved nearly every moment of it. Of course the universe believes in balance... Hence, my week so far. Sunday, late, Avery started feeling pretty fussy. She's usually quite the pistol and she just seemed to sputter out. At first, I attributed it to her eventful weekend, then Monday morning came along and she was no better. Her cough was lingering, the nose running went from clear to cloudy (then green) and her eyes started producing green boogies too (sorry if that's TMI). I was certain she had a sinus infection so I took her to the pediatrician's office after we dropped NeeNee off at school. Turns out she has a double ear infection and some fluid in her lung. Needless to say she's on antibiotics (her "meds" as she calls them). They're PINK. This is very exciting. Geneva wants some too. "No," I say. "Sissy is really sick. These are special meds for her. She has an ear infection. Sorry." The pink meds are not easily forgotten. Monday afternoon is hot and Piper is feeling a bit better. We bust out the sprinkler in the driveway and have an impromptu neighborhood kid party. ... especially Geneva. She feels great. Though, that night she asks for some of Sissy's pink meds because she's "sick." "No," I say. "No meds for you." Tuesday Greg leaves for Baltimore. We skip swim lessons because the doctor thinks that would be best. We have a mellow day. Geneva is not as "high strung" as she usually is... I attribute this to our quiet day. She certainly hadn't lost her sense of humor. Here she is "reading" my book. Apparently, I must look like this a lot of the time? Funny. She actually laid there flipping pages for about 4-5 minutes. Good thing she can't actually read (since that's one of my "trashy" vampire novels--Sookie Stackhouse anyone?). Today she woke up at 5:15 am rather than her usual 6:45 and did not manage to fall back to sleep. I took her to school and went to the gym. When I finished my workout, I retrieved my phone from the locker room and noticed (with alarm) that I had missed a call from her school (they have NEVER called before), a call from Greg (in Baltimore), and a text from Greg as well. Turns out Miss Geneva is complaining that her ear hurts and has had a huge crying fit over it at school. Her teacher is so alarmed (because Geneva "just doesn't DO that") she called to have us come get her (though she has no fever). By the time I got the message and called back, Geneva was curled up, sound asleep in the "kitchen" at school. It was 11:30 am. Nap time is typically at 1:00 pm after she gets home from school. I rushed over with Avery and collected my very sleepy girl. As soon as she opened her eyes she pointed to her right ear and started whimpering. She asked if she could have some pink meds because her ear hurt. "No Honey." I said, "I think you need a nap first." Because obviously she's not really sick--she's just VERY tired and obsessed with her sister's pink medicine. "Can you take me to the doctor's?" she asked. "Let's see how you feel after your nap," I reasoned. She slept for 3 hours at home and while she slept I agonized over whether I would "waste" the money taking her to the doctor's when I knew she didn't really have an ear infection. I made an appointment anyway. When she woke up she looked WAY better. I asked her how she was feeling and she indicated that her ear was still hurting. Funny thing is, she was tugging at her LEFT ear. "Honey, it costs a lot of money to go to the doctor's office," I told her. She just looked at me. "If you're really feeling bad and you think you need to see the doctor, then I think I'm going to take some money from your piggy bank to pay for the appointment. Do you feel like you still need to go--even if Mommy uses your money?" She asked, "But what about my college?" "We have lots of time to save for that. I wont have to use all of your money for the appointment (of course I'm not serious... I just want to hear her reaction). Do you NEED to go to the doctor? Do you feel really bad?" So we went... even though I knew it was a waste of time and money. 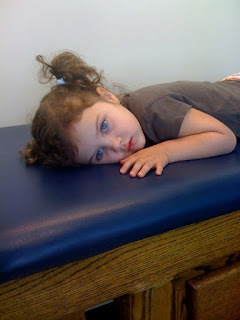 Here she was "playing it up" on the exam table before Dr. Cooley came in. ... turns out Geneva has a double ear infection as well. It's not as bad as Piper's because we (I mean Geneva) caught it earlier. It seems they've both been fighting another virus (the family cough we've been struggling with for almost 2 weeks now) and as the virus moved on the bacteria moved in. In case you're wondering, Yes... I am choking on my shoe right now! I cannot recognize symptoms of an ear infection to save my life.